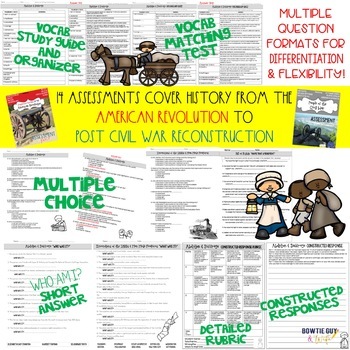 Ready to assess history from the American Revolution to Post Civil War Reconstruction? This assessment bundle of 14 social studies tests will provide you with various ways of assessing your students! Includes a vocabulary fill in the blank (which students may fill in to use as a study guide), a vocabulary matching quiz, a multiple choice test, and a constructed response writing (rubric included). Most also include another short answer assessment asking students to fill in the blank. Please download the PREVIEW for a closer look! Printer friendly, perfect for B&W copies! 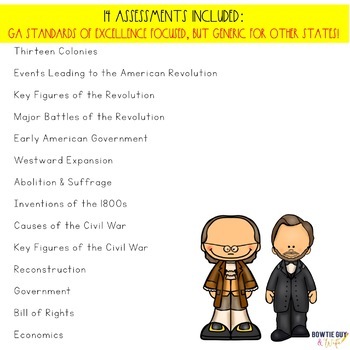 Focused on meeting Georgia Standards of Excellence for fourth grade but generic enough for other grade levels and states covering history from the time of the Revolution to Reconstruction. 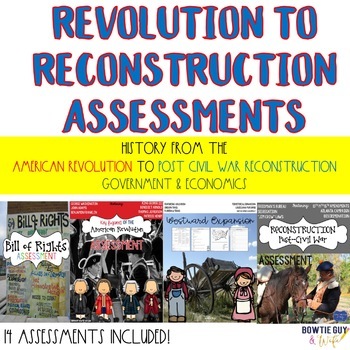 Don't miss my best selling Revolution to Reconstruction Leveled Texts! Want an editable & self grading bundle of these tests? Check out my Fourth Grade Reading Fluency Passages! Social Studies Interactive Sorts For the Year BUNDLE! Science Passages for the Year! Interactive Science Sorts for the Year! © 2017 Bowtie Guy This purchase is for you and your classroom. Duplication for an entire school, an entire school system, or for commercial purposes is strictly forbidden. Please have other teachers purchase their own copy. If you are a school or district interested in purchasing several licenses, please contact me for a district-wide quote.